Restoring the Lauter-Humana Air Motor is not a simple task. So it only follows that adjusting it to work properly is also somewhat difficult. Unfortunately, the adjustment phase looks pretty easy. Consequently, many Lauter-Humana air motors are incorrectly regulated and therefore perform at 'less-than-optimum' for no apparent reason. Fortunately, with a little understanding of the basic "musts", even a 'less-than-perfectly' restored unit can be adjusted to work exceedingly well without starting over. For reasons of brevity, it will be assumed that all of the wooden surfaces which come in contact with vacuum have been well sealed. It will also be assumed that the center of each pouch is capable of touching the bottom of the pouch well and that the pins which protrude from each pouch are correctly oriented, i.e., the long pins are on the bottom row of pouches and the short pins are on the top row of pouches. 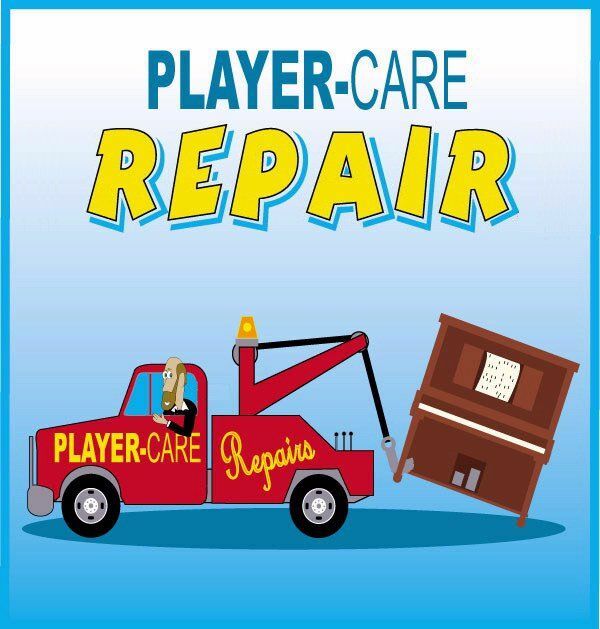 NOTE: As with any procedure, it is highly recommended that you read the entire treatise before tackling the job. In a few instances, it is not possible to address every aspect of a particular process within the same paragraph, as doing so might lead to confusion. Once the intentions of the various steps are understood, making the adjustments will go more smoothly. Begin the adjustment process by loosening all nine of the set screws that hold the pieces of linkage together. Then disconnect all of the pieces of linkage from their associated parts. Turn the motor so the pouches are facing upwards. 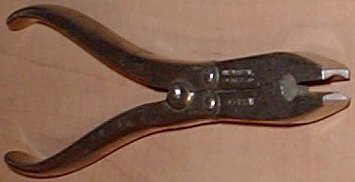 Move the three rocking levers out of the way and examine the angle of the protruding pouch pins. All six pins "must" be pointing straight up and each set of opposing pins "must" be in a straight line. (See Fig 1-2) If they are not as just described, DO NOT start bending the pins. The next step is to move any of the three levers over its respective set of pouch pins. Ideally, the holes in the wire keepers will line up perfectly with the pouch pins. If they don't, the pins have to be bent accordingly. 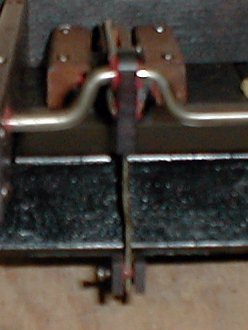 Unless you have a wire bending tool (See Fig 3), bending the wire can be a rather difficult task. However, the first, or primary bend should be made as close to the fiber disk as possible. 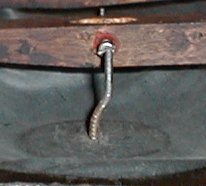 Exercise caution as the head of the pin, which is actually a flat head nail, is hide glued between a piece of heavy bellows cloth and an 1/8" thick fiber disk, and fracturing the glue could create a small leak. (Should that happen, the base of the pin, where it comes through the cloth, can be sealed to the cloth with Phenoseal.) While making the primary bend, try to anticipate the second bend. Ideally, the combination of the two bends will render a 1/4" section of pin, at the top, that points straight up. 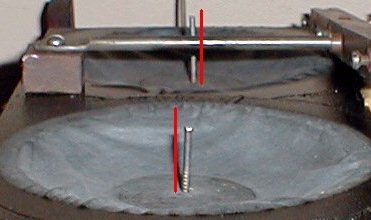 As can be seen in the two pictures below (See Fig 4-5), the pouch pins are grossly out of position. 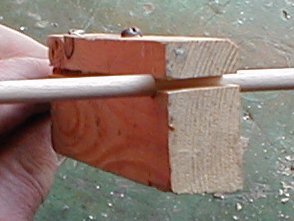 Below is a picture of a pin after the first bend has been made. 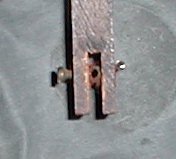 (See Fig 6) Note the relative position of the set screw to the pin. As explained previously, anticipating the second bend will help avoid bending the pin multiple times. While the pin will bend fairly easily, it is metal and it can break. Figure 7 shows the pin after the second bend has been made. Here again, note the relative position of the pin to the set screw. Referring back to Figures 1 & 2, notice that the pins are not pointing straight up. In fact, one pin is leaning to the left and the other is leaning to the right. Accommodating these errors was actually handled when the first and second bends were put into the pin. Unfortunately, due to the angles at which the pictures were taken, this fact is not obvious. 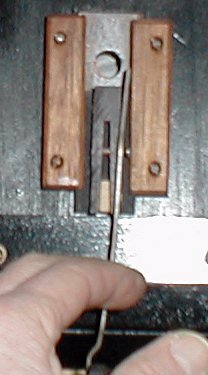 However, as seen in the pictures below (See Fig 8 & 9), the lever can be used as a straight edge to determine if the pins are correctly positioned in the vertical plane. Figures 6 & 7 show the positioning of the pins in the horizontal plane. Sometimes the pins will be badly out of place. 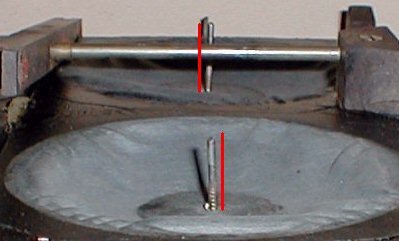 (See Fig 10) In such a case, it's important to determine where the pin should actually be located before you start bending the pins. This is easily done by measuring the width of the section and dividing by two. 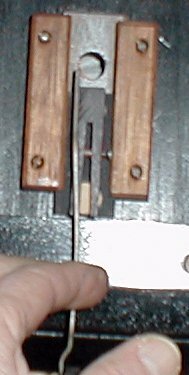 Once that's done, the pin can be bent in exactly the same manner as stated previously. 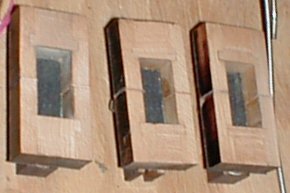 Now that the pouch pins have been correctly positioned, they will slip into the wire keepers without any effort and each lever will be in the 'geographical' center of its associated section. For the time being, connect the pouches to the levers, allowing from 1/16"-1/8" of the pin to protrude through the wire keeper. (You might have to change the position of the pouch later, so don't over-tighten the set screws.) Move each of the levers up and down a few times to see how it feels. Also note how far each lever will move in both directions (up and down). This will be important shortly. In the next step, the connecting rods get positioned in the center of their respective crankshaft lobe. 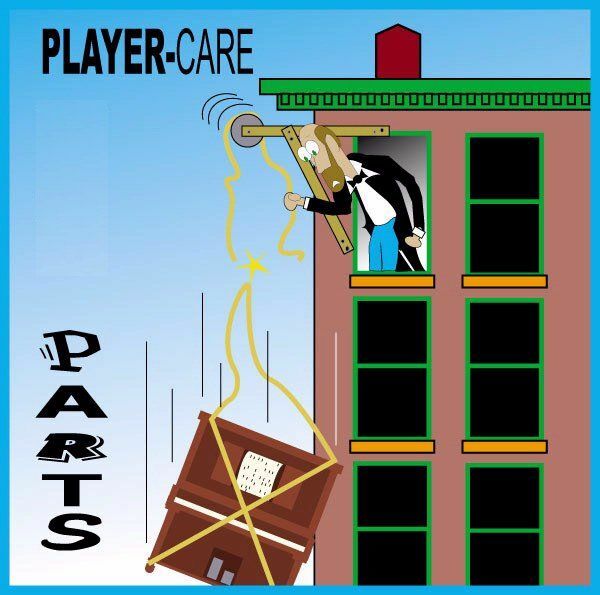 In Figure 14 you can see that the connecting rods on the right and left are both positioned to the left of center, whereas the rod in the center is where it belongs -in the center of the lobe. Also notice the bend in the pouch pin in the center section of the motor. If you look carefully, you will see that even though the pouch pin is bend rather significantly, the lever itself is right in the center of the section and, since the connecting rod is nice and straight, it's right in the center of the lobe. However, even though it isn't plainly visible in the picture, the left and right connecting rods have slightly different problems. The rod on the left is actually bent where the wire goes into the wood, and the wire itself is also bent. 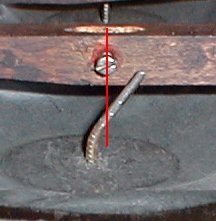 As it turned out, the wire was not screwed into the wood all the way, and while tightening it up, it was obvious that it was not straight. 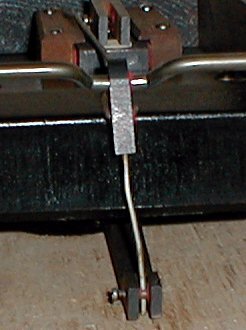 It was also found that the wire that connects to the sliding valve was applying pressure to the connecting rod, pulling it to the left. So, it was disconnected. I also disconnected the other two wires because I realized that the pressure, or tension, of those wires might be effecting the position of the connecting rods. (See Fig 13) NOTE: I know I said at the very beginning that all of the wires should be disconnected before starting. And this situation, which became apparent well into the adjustment process, is precisely why I made that statement. However, by the time I realized the importance of disconnecting everything, the pictures had already been taken, and I couldn't go back and start over. Now you need to rotate the crankshaft through all 360 degrees of rotation and see how things 'feel'. Ideally, everything should feel smooth and the crankshaft should rotate without any resistance. It's also wise to rotate the crankshaft to the point where each pouch is at its highest and lowest point in its associated well. While it's there, feel the cloth with your fingers. Under no circumstance should the cloth feel taught. It should always have a little more 'give', or room to move a little further (either 'in' or 'out'). If by chance you do encounter a pouch that is a little taught, loosen the set screw and adjust the position of the pouch to relieve the condition. Then move the pouch to the other extreme and check it again. If you have a problem getting a pouch to conform to the above conditions, you can change the position of the lever by adjusting where it's secured to the connecting rod. However, if you have to resort to changing the position of a lever, chances are that the pouch should be done over again. With a little bit of time, the wire can be reshaped so that it looks like the one in the pictures below. The main thing to note is that the angles and shape of the wire are relatively uniform. The basic logic being that everything will have a natural tendency to move in a straight line as opposed to some arbitrary angle. That being the case, the energy created by the pouch will be transferred most directly and uniformly to the crankshaft. When you're all done and the wires have been put back in place, they should all be resting comfortably in the center of their respective valve guides. (See Fig 27) They should also have an equal amount of side play. 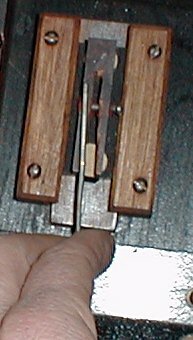 If they are not straight or the side play is not equal, slight corrections can be made in the primary bends. At last we come to the sliding valves. Most simply put, they should be attached to the valve wires such that they oscillate an equal distance back and forth across the center hole (vacuum supply hole) as the crankshaft is rotated through all 360 degrees of rotation. Correctly positioning them is best accomplished by trial-and-error, so don't over-tighten the set screws until you're certain the valves are in the right place. 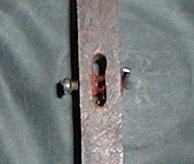 If you do over-tighten the set screws, making a slight adjustment one way or the other will be extremely difficult because the set screw will have a natural tendency to find its way into the previous indentation in the wire. 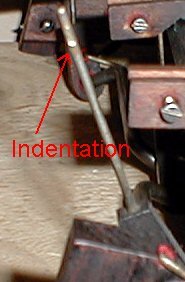 As a matter of fact, it may have a tendency to do that anyhow because of the indentation that was made in the wire when the motor was first assembled. If that happens, and you just can't seem to get the valve to sit in the right place, there are two options. One, file the wire and remove the old indentation. Two, increase or decrease the bend in the wire that is closest to the valve. I refer to this as "fine tuning" the wire. This should only be done if you are moving the valve 1/16" or less. Adjustments of more than 1/16" should be done by using the set screw. Once that's done, it's time to run the first functional test. Connect a regulated vacuum source to the main vacuum supply flange. For the initial test, set the vacuum level between 7"-10". Let the motor run for a few minutes and then start decreasing the vacuum level. If the sliding valves and the block were correctly flattened while the motor was all apart and everything has been well adjusted, the motor should run extremely smoothly on as little as three inches (3") of water vacuum. If it does, you have done an excellent job. However, this is rarely the case. And, as you will see shortly, it's very wise to run the motor under a slight load for at least ten minutes and then examine the sliding valves. 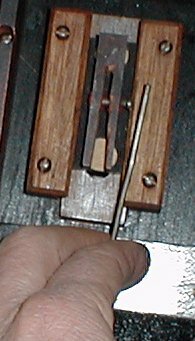 [I made up a simple tool for applying a load to the crankshaft. (See Fig 28a & 28b) You can also hook the motor up to the transmission and put the transmission in the Rewind mode. This will apply a slight tension to the motor via the Rewind Brake mechanism.] Unless you've done a perfect job of flattening the valves and block, what you will see on the sliding surface of both the block and the sliding valve is some sort of an irregular pattern or "footprint". What the footprint tells you is where the two pieces of wood are actually touching each other. (See Fig 29) Notice the voids in the footprints. This is where air is leaking into the motor. Fixing the problem will require patience and tenacity. The best way to fix the sliding valves is to put a piece of 400-600 grit sandpaper on a piece of plate glass (at least 3/8" thick) and gently lap the surface of the valve. Examine the surface after each pass. Below is one that is almost done, and next to it is the finished set. Now assemble the valves and test them again. After running the motor for awhile under a load, examine the valves again. If the footprints are even, then the valve block must be resurfaced. 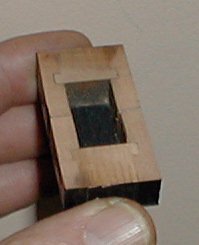 Use the same technique as was used to resurface the sliding valves. After finishing, apply a coating of powdered graphite with your finders, rubbing it into the grain of the wood. For best results, mix the graphite with a small amount of alcohol and make a paste. Then work that into the grain and let it dry. Then, using a razor blade, carefully remove any excess graphite. Then very lightly sand the surface with 600 grit paper. When you're sure that both the sliding valve and the block are flat, work some powdered graphite into the surface of the sliding valves and finish assembling the motor. Now Playing: "Thunderin' Love", by John A. Tuttle.